Iron ore has been in the doldrums, but this trio is probably the best way to play the space. Iron ore prices have been weak of late, making iron ore miners an out-of-favor group. But the industrialized world, and those striving to join it, can't work without this commodity, which is a key ingredient in the production of steel. So, if you want to find the best stocks to invest in iron ore, you are really looking for the stocks with the wherewithal to survive this often volatile industry's weak spots. For that, you should look at BHP Billiton Limited (ADR) (NYSE:BHP), Rio Tinto plc (ADR) (NYSE:RIO), and Vale SA (ADR) (NYSE:VALE). BHP Billiton is one of the largest miners in the world. Although it pulls more out of the ground than iron ore, including copper, metallurgical coal, and oil, iron ore is its biggest business. Iron ore accounts for a third of its top line and nearly 60% of its earnings before interest and taxes. So, while BHP is more than just an iron ore miner, its results are driven by this segment. Iron ore pellets. Source: Black Tusk, via Wikimedia Commons. The thing about BHP is that it traces it roots back to the mid 1800s -- that's over a hundred years of mining. It's seen a few commodity downturns in its time, and it's ready to deal with them. For example, it's been reducing costs since 2012, effectively when the commodity markets started to turn lower. It's pushed its cost structure 30% lower since the peak and believes it still has room to cut. And then there's the issue of debt, which stands at around 30% of the capital structure. That's a reasonable level, even for a company in a commodity business with often volatile pricing. 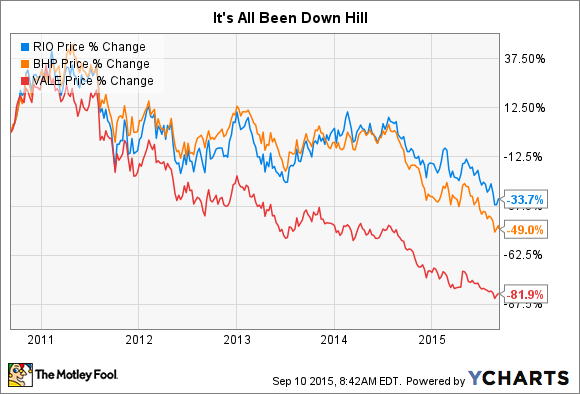 More important, however, is that BHP remained profitable between fiscal 2011 and fiscal 2015, when the real pain of the downturn hit. Earnings aren't what they were at the peak, but BHP is doing better than just surviving, while a lot of other miners are left praying they can make it to the other side of the downturn. Rio Tinto is another large, diversified miner with a heavy focus on iron ore. It hasn't remained profitable throughout the downturn, turning in a loss in 2012, but that was the only year it bled red ink between 2011 and 2014. Iron ore makes up around 50% of Rio's earnings before interest, taxes, depreciation, and amortization. But it also has a footprint in copper, coal, aluminum, and other things, like uranium and diamonds. But, as with BHP, iron ore is the main show. And like BHP, Rio Tinto traces its roots back over 100 years, so it's seen and lived through boom and bust cycles before, too. Debt at Rio is around 30% of the capital structure, so it has room to breathe, as well. One of the biggest differences between BHP and Rio might actually be the dividend. BHP has over a 10-year history of annual increases and has verbally stated it wants to keep the streak going. Rio's dividend tends to move up and down over time. Although income investors might prefer BHP's increases, Rio will have more opportunity to cut if it needs more flexibility since investors aren't necessarily expecting an ever-increasing disbursement. Not a huge difference, per se, but one that could prove helpful if the downturn lingers for longer than expected. That's especially true with regard to investor perception, which is the driver of share prices over short periods of time. BHP and Rio both have major iron ore operations in Australia. Vale, another iron ore giant, is based mostly out of South America. That's a problem in some ways, since the biggest demand for iron ore has recently been coming out of Asia. But it's a benefit in other ways, since it has easier access to more stable demand in developed markets in the Americas and Europe. Vale generates around two-thirds of its revenue from iron ore and roughly 80% of its earnings before interest, taxes, depreciation, and amortization. Of the three, it's the most dependent on this commodity, though it, too, has other businesses like coal and fertilizers. And like Rio and BHP, it's been cutting costs and improving operating efficiencies to deal with the current downturn. Also like the other two miners, debt is around a third of the capital structure. But earnings, while in the black between 2011 and 2014, haven't been as robust in the last couple of years. That means less room for error, and it helps explain why the shares have been down the most out of this group since recent peaks. Add to that an often volatile dividend, and investors have a right to be spooked. Still, like Rio and BHP, Vale looks like it will survive this downturn like it has so many others in its more than 70-year history. True, Vale is a lot younger than the other two miners, but it clearly knows a thing or two about muddling through until better days. This time looks like it will be no different. That said, it is the riskiest of the three names here, but also the one with the most upside potential. There's an old saying, "This too shall pass." When you're dealing with a volatile commodity like iron ore, that phrase holds great meaning. For starters, despite all the negatives, iron ore will rise again... some day. It is too important to the world not to. Secondly, you'll want to make sure you get behind the companies that will be there to see the upturn. And that's what makes BHP, Rio, and Vale three of the best stocks to invest in iron ore today.